When it comes to safe winter driving, your first concern should be the part of your car that touches the road - your tires. There are several options for winter tires, so it's hard to know what's best for your situation and your car. Learn about the different options below. Whether your car is front-wheel drive, all-wheel drive, or rear-wheel drive, install snow tires on all four wheels to keep your car's performance balanced. Keep your tire pressure at the recommended amount. Brake slowly and steadily before turns. Don't slam on your brakes. Wait until your steering wheel is straight and you're out of your turn before you accelerate. Check your tire pressure. Cold weather can make tire pressure change. Install snow tires on all wheels, not just two. Wait until you're done turning before accelerating. Your car gains traction more easily with studs, so drive slowly. If you lose traction despite the studs, take your foot off the gas pedal, turn the wheel slowly in direction you want to go, and put your foot on the brakes. Install tire chains on all four tires, which means you will have to buy two pairs of chains. Buy chains that are the correct size for your tires. Do not deflate your tires to install the chains. The chains should fit over properly inflated tires. 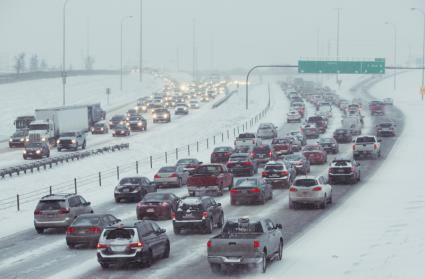 Use chains that are SAE Class "S" so they safely clear your car's fenders, suspension, struts, brake lines, and braces. Pre-fit the chains before you actually have to use them. Keep your chains in the trunk at all times. Re-tighten the chains after you drive the car about 15 feet. Speed up and slow down gradually, and don't spin the wheels. Drive within the chain manufacturer's recommended speed (usually under 30 mph). Do not drive with broken chains. Take chains off as soon as you reach clear roads. Snow tires aren't just for when there's snow outside. No one expects drivers to change their tires back every time the snow melts. Snow tires are great for snow, slush, ice, and water. According to Bridgestone, it's smart to invest in a set if you live somewhere that gets a lot of precipitation in the winter. Remember, however, to go back to all-season tires once spring comes so you're driving as safely as possible.